Have you ever wanted that mellow-aged look of Moss growing between the flagstones of a cool/shaded walkway? You can add it to soften the look of new construction, as well. Get ready for a little bit of moss gardening, as I explain how to seed flagstone walkways with moss! 1. Decide which Moss, indigenous to your climate, you would like to cultivate. Many varieties of Moss exist, including Dicranum, Polytrichum, Leucobryum and Hypnum. If you can't find Moss for sale at your local Arboretum or Garden Centers, go out on a Moss hunt to find some healthy specimens. Since healthy Moss likes water, look near rivers or streams. Once you find it, roll some up like a mini carpet and put it in a plastic bag to keep it moist. Avoid sticks, tree bark and stones and shake off all of the dirt that you can. You will need several large, clean samples. 2. Make a Moss slurry. Combine Moss and skim or diluted buttermilk at about a 50/50 ratio, in a food processor or a blender. Pulse until chopped up into fine little bits. You're not trying to make a milk shake here so don't liquefy the Moss! You just need to break up the living plant matter, mix it with a medium and transplant it. Moss actually gets its nutrients from the air, not from the soil. The medium here helps to set the PH level so the Moss will take. 3. Transfer the Moss slurry to a non-breakable plastic drink pitcher. 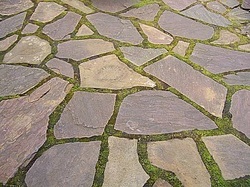 Carry it outside to the cool/shaded flagstone walkway. For best results, dampen the dirt & clay between the stones with spray from a garden hose. Stir the mix and slowly pour the Moss slurry between the stones, enough to turn it green. Careful not to seed the surface of the stones, since Moss will grow there too. Moss can make them slippery and too dangerous to walk on! If any overflows onto the stone, brush it off into the desired area. 4. Obtain enough plant matter to achieve the desired coverage. The amount of Moss you'll need to harvest for this project depends on the size of the area to seed. You may end up making several trips out to the woods, before you have harvested enough. But, with any luck, the satisfaction you will get from the results will outweigh the effort! * Wet down your stone walkway at night, for a couple of weeks, especially when there has been no rain. * Be careful not to apply so much water that you wash the Moss away. * It never hurts to reapply your Moss slurry, especially in slow to take areas. * Moss grows best in poor soil which does not drain well. If Moss will not grow in some places, perhaps there is too much drainage or the PH level is either too high or too low. Ideally, the PH should be between 5-6. * Soil with a high clay content holds water best. * For small areas, it is easier to cut Moss to size and transplant it like sod, being careful to remove all air pockets underneath. * Moss will not grow well, if at all, in close proximity to copper downspouts. * Drainage from a roof treated with Zinc sulfate strips will burn Moss, Lichen and many other types of plants. * If you do go hunting for it, watch out for poison oak, ivy, sumac, and snakes!